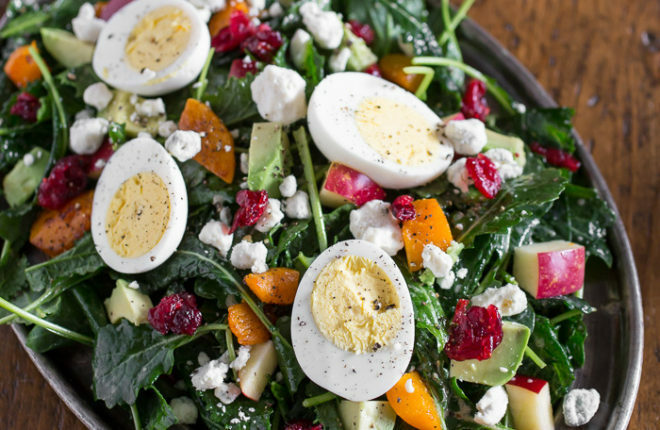 With its gorgeous colors – emerald, ruby, and gold – and its juxtaposition of savory and sweet, this salad is addicting in the best possible way. Because, well, it’s salad! It can be made vegan, just dairy-free, vegetarian, or with meat – whichever way, it’s no wimpy side salad. No, it’s a meal. Note from Kare: A few months ago, I was feeling frustrated by my limitations when it comes to creating recipes for you guys. Mainly, the whole dairy-free thing. So I asked around, and by a mad stroke of luck, two incredible food bloggers agreed to share recipes here on Kitchen Treaty every month or so. 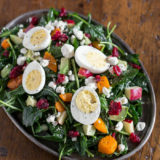 You heard from Gina a couple of weeks ago, and today, Brandy from Nutmeg Nanny is here to share this winter salad – yes, an epic one – with you, a last hurrah of sorts before we plow headlong into spring. 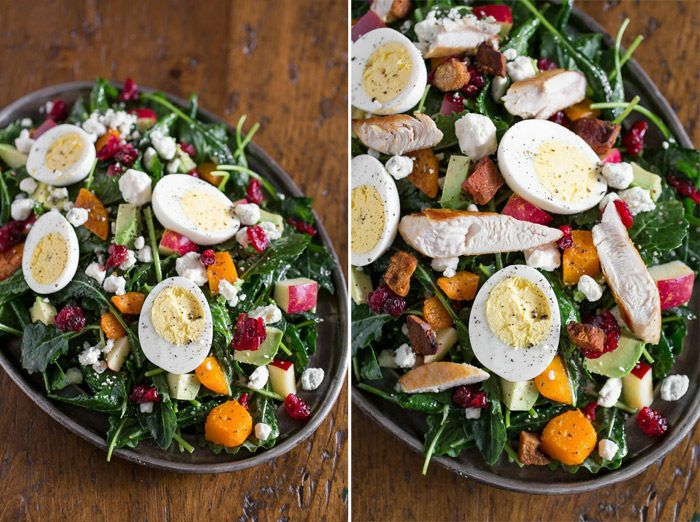 I had this salad for dinner last night and I had to force myself to stop eating it – it’s that good! Welcome, Brandy! I am so happy to have you here. Take it away! This winter has been toying with my emotions. One second it’s unseasonably warm and the next it’s so cold I keep thinking to myself “why do I live here? !” On those super cold days I usually get a craving for all things summer. I want salad. I want ice cream. I want iced tea. I want the most ridiculously inappropriate foods for -20 degree weather. But because I’m totally all about giving into my cravings I decided to make a salad. It’s not your typical “summer” salad but it still has all that fresh flavor. This plate of deliciousness is made with baby kale because I personally find it to be a bit easier to eat for salads. If you wanted to you use regular curly kale it’s still totally doable, but you might want to give it a little massage first. Just like massages help your shoulders feel more loose, it’s the same for curly kale. Plus it’s fun to go around saying you massaged your kale. Also staring in this dish is hard boiled eggs, roasted butternut squash, dried cranberries, avocado, apple and blue cheese. 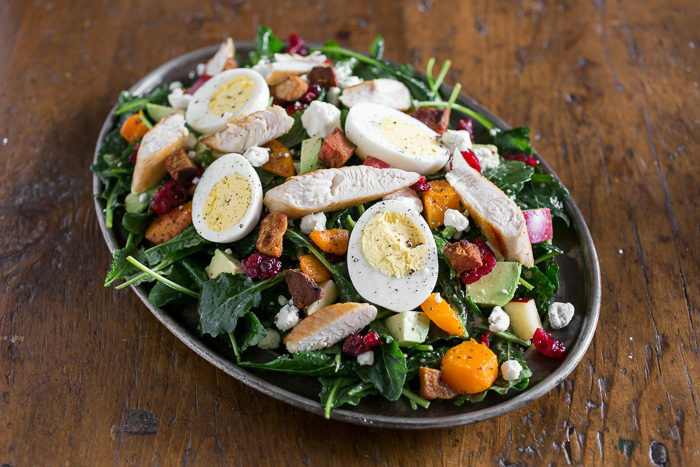 If you prefer a little more protein with your salads you can also add more eggs, or, if you’re a carnivore, some crispy fried bacon pieces and some grilled chicken. I usually throw on the additional meat because I love to eat my salads for dinner and protein is just about the only thing that stops me from becoming super hangry. If you don’t know what hangry means it’s mean so hungry you become angry. In other words I turn into the Hulk. It’s not a fun scene for anyone. Throw in your greens and then top with all your other ingredients as they cook and cool. When you’re finally ready to eat the salad, THEN toss quickly and serve. So even though it might only be a high of 30 degrees today I can still dream of summer days by sitting down with this salad and eating the day away. Roast the butternut squash. Preheat oven to 400 degrees Fahrenheit and line a small baking sheet with parchment paper. Add butternut squash to the baking sheet and drizzle with olive oil, kosher salt, and black pepper. Toss to evenly coat the squash. Roast until soft and slightly golden in color, about 20 minutes. Remove from the oven and let cool to room temperature before putting on the salad. Make the salad dressing. In a large salad bowl (the one you will use for serving) add vinegar, lemon juice, honey, Dijon mustard, garlic, kosher salt and pepper. Whisk together until smooth. Slowly drizzle in the olive oil until the mixture is smooth and combined. Taste the dressing and add more kosher salt and pepper if desired. Assemble the salad. 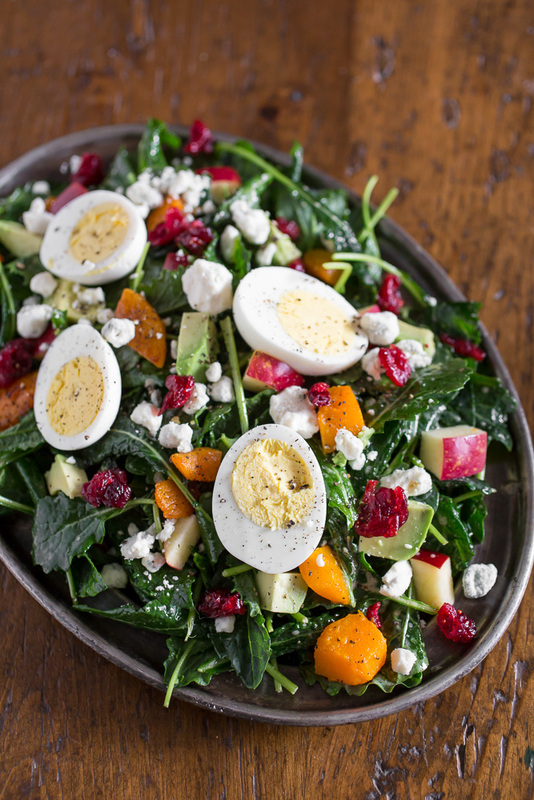 Top the dressing with the baby kale, butternut squash, avocado, apple, blue cheese, and cranberries. Toss to combine and make sure all ingredients are evenly coated. Top with eggs and serve. Add slices of grilled chicken or cooked crumbled bacon. Or both. Omit the blue cheese and eggs.